Cricklade Historical Society which runs Cricklade Museum, presents a series of talks throughout the year about historical and archaeological topics relating to Cricklade and its environs. They take place on the third Wednesday of every month except August and December in Cricklade Town Hall Annex. April 12th 2014: Book Sale Opens at 10 a.m. at The Club at Cricklade. The first of three book sales a year the Cricklade Historical Society runs as fund raising for the Cricklade Museum. 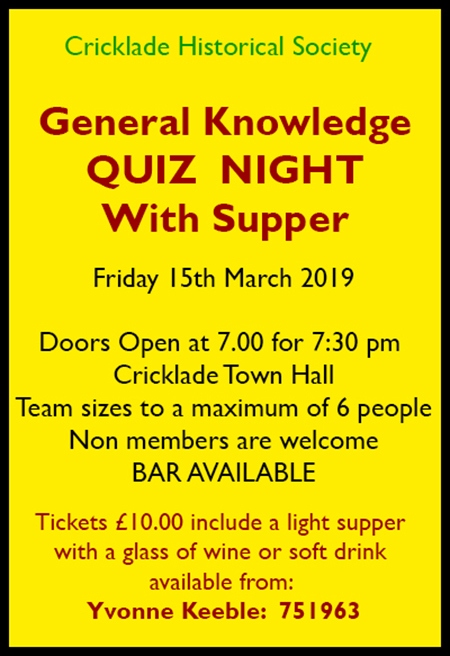 This event has been increasing in popularity since we started to hold them at The Club at Cricklade. Car parking is easy and there is a wide choice of reasonably priced fiction and non fiction books. The club provides coffees and wonderful cooked breakfasts. The Book Sale opens at 10.00am and closes at 12 noon. If you have books you would like to donate to our fund raising for the Cricklade Museum we would be pleased to receive them. Email: chairman@cricklademuseum.co.uk to let us know you have spare books. We hope to see you there.